To make the marinade: mix together the orange and lime juice, vinegar, piloncillo, garlic, salt, pepper and bay leaves in a bowl. Begin to layer the banana leaves in a large baking dish, one by one. Place the first one vertically so it covers the whole dish, leaving the sides hanging over the dish on both ends. Layer the second leaf horizontally so it covers half or so of the dish, with the sides hanging over the dish on both ends. Layer the third one horizontally the the bottom of the baking dish is fully covered with leaves, with extra hanging over the sides to wrap up the meat. If you can’t find banana leaves, you can use tin foil. Place the meat in the middle of the leaf bundle. Pour the marinade on the top and cover the meat with each of the banana leaf layers on all sides. Let it marinate anywhere from 2 to 24 hours in the refrigerator. 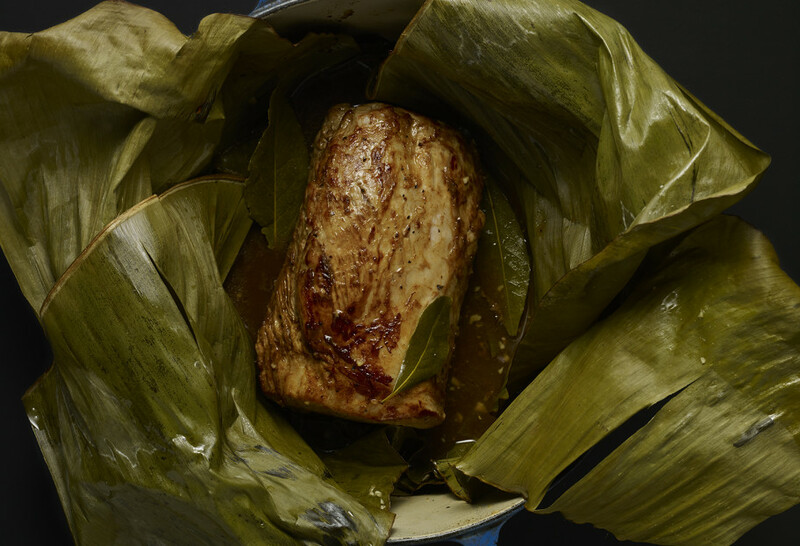 Preheat the oven to 350 degrees and unwrap the pork from the banana leaves. Heat the oil in a large skillet over high heat, until it is hot but not smoking. Sprinkle the pork with salt and pepper, place it in the pan, and sear for about 1 to 2 minutes on all sides. Place it back in the banana leaves and bundle it back up. Place the wrapped pork into the oven and cook for 1 hour and 30 minutes. Remove it from the oven, carefully open up and unfold the banana leaves, tucking them on the sides until you expose most of the meat. Remove the meat from the dish to rest on a cutting board. Pour all the marinade into a sauce pan and set over medium high heat, for about 10 to 15 minutes, to reduce up to 1/3 of its volume. Meanwhile, slice the meat at about 1/2″ thickness or to your liking. Place the slices on a platter, drizzle some of the sauce on top and serve. Sure, Jasmine! It will just take longer to cook.